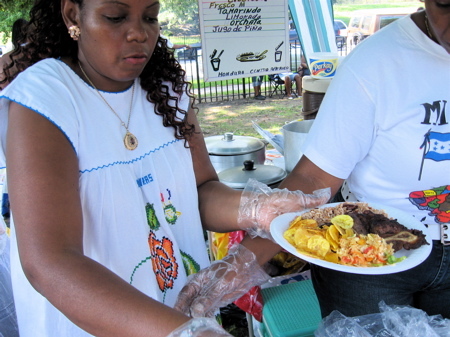 Busiest Food Tent at the Honduran and Central American Day Parade in the Bronx. 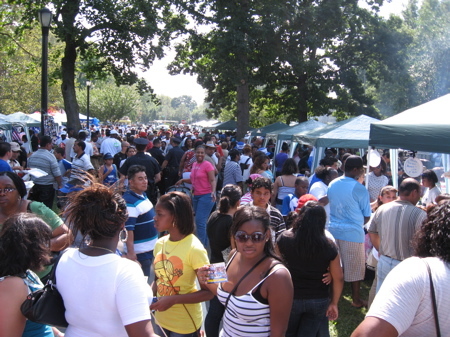 Food Tents in Crotona Park for the Honduran & Central American Day Parade. 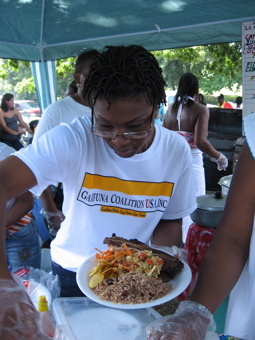 Dishing up a Garinagu plate in Crotona Park. 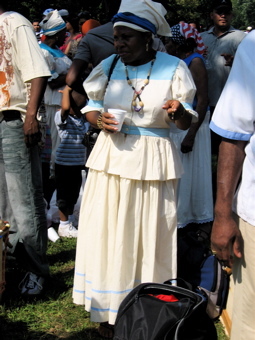 Last Sunday we were in Crotona Park having our first taste of food from the Garinagu/Garifuna. We were a few among many gathered in the park for The Honduran and Central American Parade. When we arrived at about two o’clock, the parade appeared to be over, (I was not able to find out exactly what streets for the parade route) but we were just in time for the food. We headed to the tent with the longest line and smokiest grills. We sampled a plate of grilled steak (a bit tough, but nicely flavored), red beans and rice, crispy fried plaintain, pickled onions (red, sweet and vinegary–nice condiment) and a crunchy side salad like a slaw (also nice). And we had fresh lemonade (ahhhh). The Garinagu are the offspring of the Black Carib people from the island of St. Vincent. In 1797, the Black Carib were deported to Roatán, an island off the coast of Honduras, by the British and from there, after tiring of Spanish rule, eventually sailed to Belize, Guatemala and Nicaragua. I came to learn that the Bronx, unofficially, has a larger Garifuna community than Guatemala, Belize, Nicaragua and the Honduras (which has the largest concentration) combined. I asked one of the women serving us for the name of a Garinagu restaurant in the Bronx and she said “La Orquidea on 149th St and Brook Avenue opposite the Burger King”. We intend to try it. And we’re open to other places too. Anyone have other recommendations? 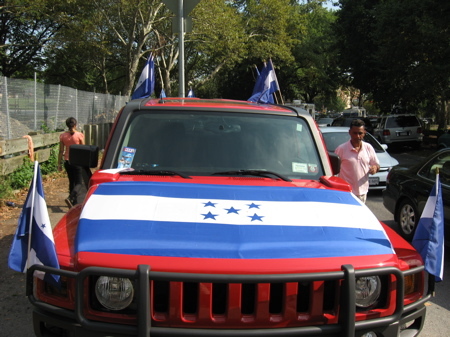 Flags of Honduras decorate this car. 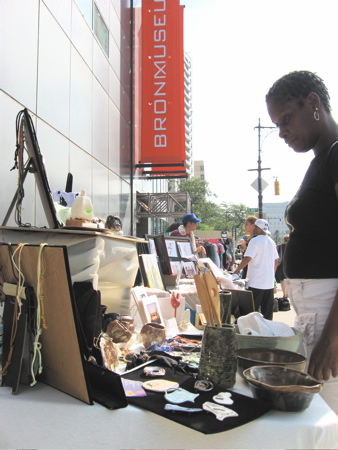 The weather on Sunday was sizzlin’ and steamy for the Bronx Museum of the Arts opening day fair of “Street Art Street Life.” It felt more like July than September. A lot of us were swarming around the Delicioso Coco Helado pushcart. I slurped on a coconut icee (yummm) which helped…for about five minutes. 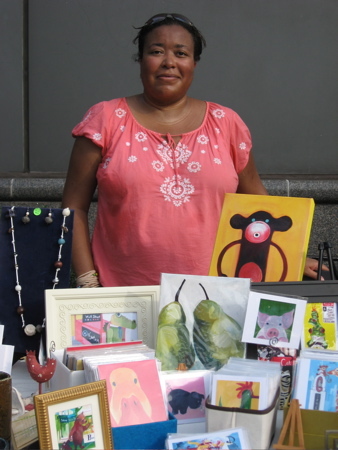 The sidewalk in front of the museum was lined with local artisans and graffiti artists tempting us with paintings, drawings, pottery, jewelry and one of a kind hand printed garments and totes. Chiz brought her farm animal prints to the Grand Concourse. I was happy to see, and meet, Bronx painter Chiz. I love her sock monkeys! If I ever wanted to write a children’s book, I’d love to have her illustrate. Holly Block, Museum Executive Director and Sergio Bessa, Director of Education stepped into the sidewalk “photo booth” for a portrait. 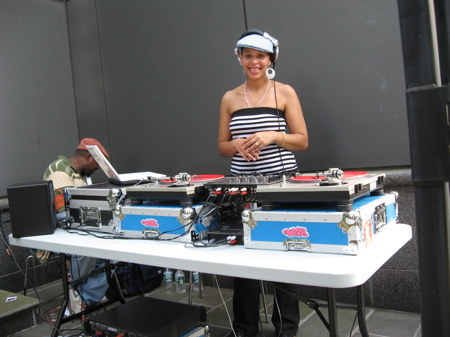 Tucked away in probably the coolest spot on the sidewalk, DJ Laylo was blending some serious old school beats and keeping the vibe super cool. b-girl, Rokafella, Hip Hop dancer Extraordinaire! 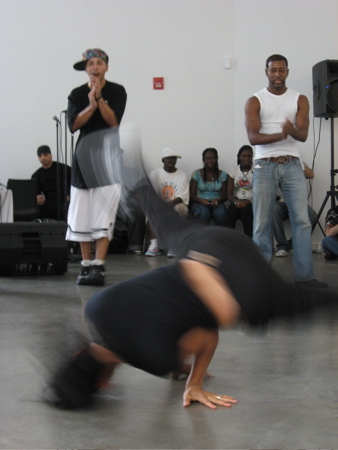 Inside the museum, Hip Hop dance performances were every hour to the beats of DJ Scientific behind the tables. We caught b-girl Rokafella and Geo and Friends. (Rokafella, an artistic director and dance instructor, organized all the dance performances.) 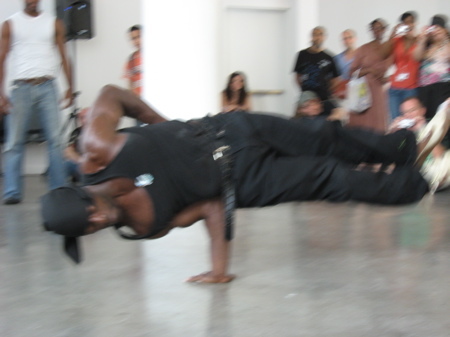 Their head spins, shoulder spins, locks and handstands kept the Museum rockin’. 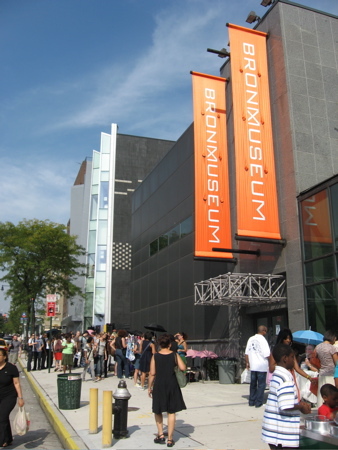 The exhibition itself was not what I thought it would be, a survey of street arts in the Bronx and the Hip Hop movement. “Street Art Street Life” is a broader look at street life post World War II to present day with selected moments of life on the streets of cities and towns well beyond the Bronx — of India and Austria and Berlin for example. Guest curator Lydia Yee has selected work from a range of 39 artists and photographers including Vito Acconci, Amy Arbus, Jamel Shabazz, Lee Friedlander, Yoko Ono, Adrian Piper and Joseph Beuys. 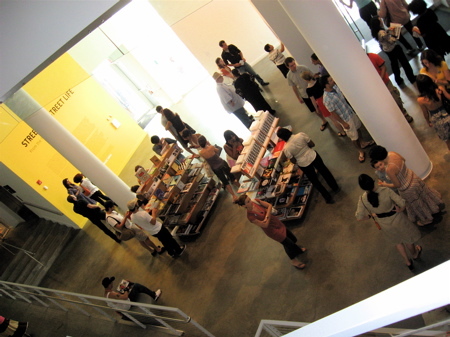 We went through the gallery quickly. I know I need to go back and spend more time. I look forward to it. It’s cloudy today in the Bronx so today’s post is a word cloud of the previous post “Who’s Dishin’ the Compost”. 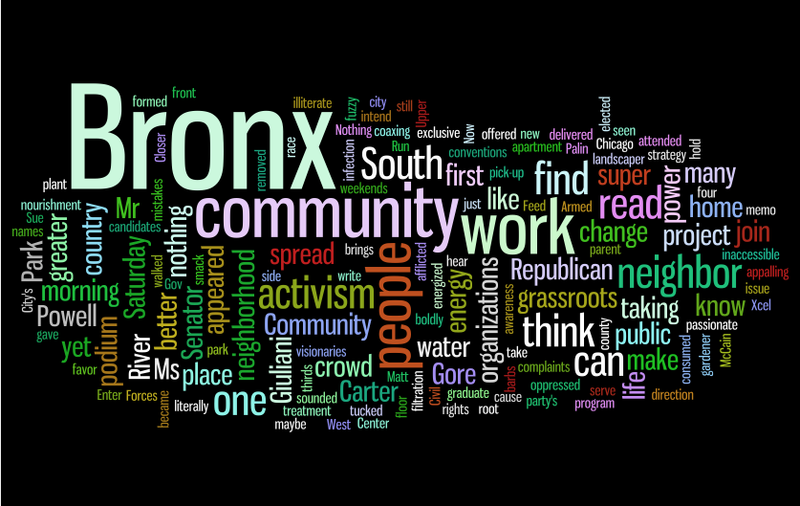 The words Bronx, community, people, work, activism and neighbor are prominent. I like that. What’s a word cloud? It is a visual depiction of frequently used words of your choosing — could be a poem…a Dr. Seuss book would be fun to use because of the repetition of words. The size of the word in the cloud is determined by how often the word is used in the original text selection. The words that appear most frequently are the largest font size. The “Category Cloud” on the right sidebar is another example of one. Want to make your own? Check out Wordle. Which is what I used to create the word cloud here. It’s fun and easy to do. And frankly, addictive. 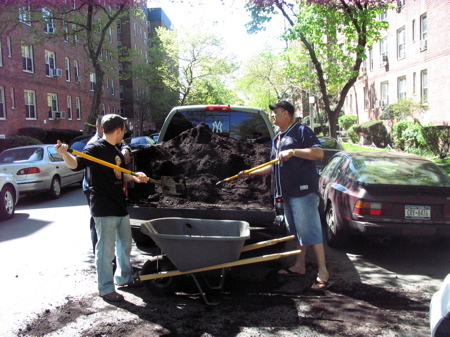 Matt and Saul, the super, shoveling compost. This is my space to write about discovering all that is warm and fuzzy about the Bronx, yet I am still reeling from the speeches delivered at the Republican National Convention last week on the community activist issue. I know the conventions are where candidates make promises they don’t intend to keep or show just how tucked in bed they are with their party’s ideology. But I can not ignore the barbs thrown from the podium at the Xcel Energy Center, because several of them have landed smack dab in New York City’s greenest borough. Gov. Palin and Mr. Giuliani used the convention stage to joke and laugh about Senator Obama’s early community work on the South Side of Chicago. Giuliani was consumed by his own chortling as he told the crowd “maybe this is the first problem on the resume” and laughter spread through the crowd like an infection. It was appalling. 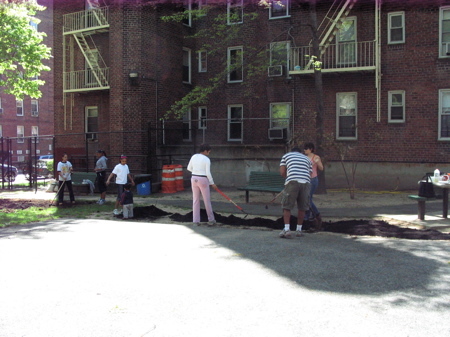 Community activism is at the root, the foundation. It is the core of where change takes place. It can take hold in anyone, Republican or Democrat, parent or student, poor or middle class. When Senator McCain took his turn at the podium, however, it appeared he had not received the memo his fellow party mates had. He appeared the most energized and passionate at the end of his speech which, sounded to me, like a call to action in favor of community activism. 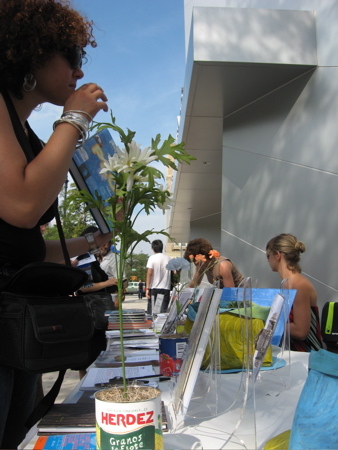 In my short tenure here in the Bronx, I have come to read about and hear the names of many people and organizations committed to grassroots initiatives – some are cleaning up the Bronx River or using art education to build awareness about the Bronx River (many children living in the Bronx have never seen the river because it is largely inaccessible). In the Northwest Bronx plans to blast rock for a water filtration project in the Jerome Park Reservoir near Van Cortlandt Park were temporarily halted due to community complaints and outcry. Other “less invasive” methods, such as drilling are being considered. I read about Majora Carter, Green Goddess Extraordinaire!, who has developed waterfront projects to revitalize the South Bronx. Her South Bronx neighborhood is home to a sewage treatment plant, four electrical power plants and the world’s largest food distribution center at Hunts Point. She leveraged a $10,000 seed grant from the city into a $3 million water front park project. In an exclusive forum attended by power brokers, visionaries and Nobel Prize winner Al Gore, Ms. Carter marvelously and boldly points out to Mr. Gore that he dismissed her offer to join his marketing strategy. She tells him that an agenda to stop global energy waste can not be successful if it wastes the energy and talents of grassroots organizations by not including them in the decision making process. Now here’s a reformer and a maverick for ya! Closer to home, I think of my neighbors. My next door neighbor Matt was literally up to his elbows in grass and roots. He became our coop’s self appointed gardener and landscaper. Every evening after work and on the weekends, we would find him on his knees planting bulbs and coaxing life back into soil so neglected and void of nourishment. Some of us gave one Saturday morning to help him. The super offered his pick-up to haul compost and the rest of us shoveled and spread it on the garden. I think of my neighbor Verena Powell who stopped us on the sidewalk one Saturday morning to say she had decided to run for a county wide seat as Bronx Civil Court Judge. Her two opponents are women, yet race and partisan politics are splitting this heated campaign in half or to some, with the presence of Ms. Powell, into thirds. I think of my neighbor Sue who formed a tenants association in her Upper West side building when she walked out of her third floor apartment to find that her shady super had removed the entire staircase. This month she entered a graduate school program in public policy. And lucky for us, she was recently elected to our coop board. These are people I know. These are people who live in my neighborhood. In the Bronx. They are taking steps in a new direction. They are community activists. Community activism is where people first see and feel change taking place. Nothing about this work is laughable. And nothing about this work strikes me as elitist. 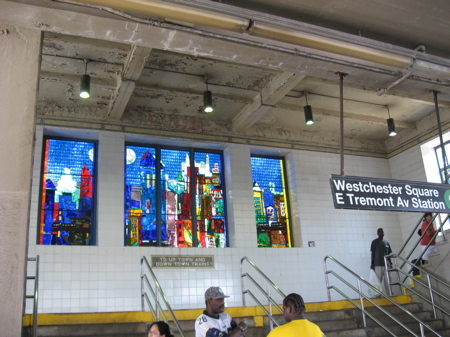 Three stops beyond my subway stop is Westchester Square-East Tremont Avenue where the vibrant stained glass windows are creations of Romare Bearden. The three windows form a luminous triptych, one flight above Westchester Avenue, at the station’s entrance. They depict a city scene that is every bit in motion. The colors are straight out of the Crayola box: fire engine red, lapis lazuli, indigo, emerald, golden yellow, sunset orange. And black subway cars weave throughout. The panels were constructed based on Mr. Bearden’s design as part of the MTA Subway Arts for Transit project. But he died in 1988, five years before the panels were completed and installed. The day I visited, the placard was almost covered entirely by a priority mail label. I peeled some of it away to reveal more of Mr. Bearden’s name and the name of the panels, titled “Untitled”. 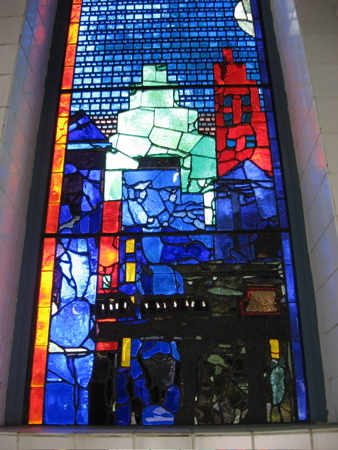 The Bearden Foundation has it labeled as “City of Glass” and the MTA notes it as “City of Light”. What I love about public art is that it can be touched. I can trace the black border around every facet (within my reach) with my fingertip. Mr. Bearden’s design was executed by Belgian architectural glassmaker, Benoît Gilsoul and fabricator, Helmut Schardt, based on a maquette and information that he had left behind. I discovered that I have unknowingly seen Mr. Gilsoul’s work before in the windows of Alice Millar Chapel at my alma mater, Northwestern University. I passed that church countless times on my way to and from my freshman dorm. Until I can afford my very own Romare Bearden work, I can walk to or pay two bucks to see and touch these brilliant windows, whenever I want. The Westchester Square-East Tremont Avenue elevated station is on the (6) subway line in the Bronx. If you take the train to the station, you’ll have to exit the station to see the windows at the entrance. If you walk or drive to the station, you can see the windows at the station’s landing from the sidewalk.